18ct White Gold Round Brilliant Cut Diamonds Dress Ring — Form Bespoke Jewellers Ltd.
A remodelled dress ring using the customer’s own diamonds. 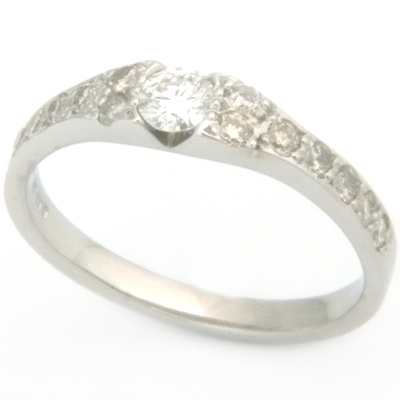 The customer came to Form Bespoke Jewellers to have the diamonds from an existing ring reset into a new style. Our expert Yorkshire team worked with them to create a design that perfectly complemented their round brilliant cut diamonds. The largest diamond was set as the centre stone of the design in a V setting. This type of setting allows for extra light to enter the sides of the diamond creating more sparkle. The shoulders of the ring start at the same width as the diamond then taper down to a smaller band. Two smaller round brilliant cut diamonds flank the centre stone. A single line of diamonds then continues about half way around the band.